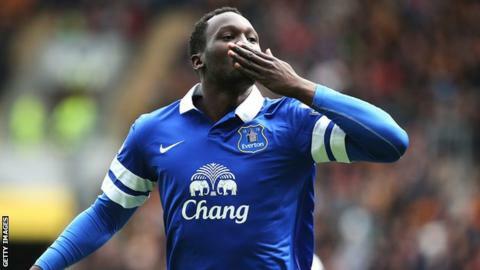 Romelu Lukaku scored in his final loan appearance for Everton as the Toffees beat Hull to finish the season with their best points tally for 27 years. Lukaku slotted home just after half-time, with James McCarthy having earlier fired the visitors ahead with his first goal for the club. The Tigers, evidently with one eye on next weekend's FA Cup final, rarely tested away goalkeeper Tim Howard. But in finishing 16th, Steve Bruce's side have achieved their aim of safety. In truth, events on the pitch had little effect on the aura of satisfaction radiating around the stadium, as both sets of fans basked in the achievement of excellent Premier League campaigns. Toffees boss Robert Martinez, whose side had already surpassed the highest points tally achieved by his predecessor David Moyes, went one better to secure Everton's biggest total - 72 - since they won the title in 1986-87. The away fans took added pleasure from events conspiring against their rivals Liverpool, with goals scored by newly crowned champions Manchester City received as enthusiastically as those by Everton. For the Tigers, there is still one monumental match remaining this season - and the distraction of next Saturday's final against Arsenal at Wembley contributed to a low-key league finale at the KC Stadium. Hull City and Everton both achieved their best ever Premier League points tallies this season, as well as qualifying for the Europa League. Bruce was boosted by the return of Alan McGregor ahead of next week's showpiece, but the goalkeeper failed to get a strong enough hand behind McCarthy's 10th-minute strike from the left of the box, Steven Naismith having supplied the assist with a threaded pass. The next goal cheered by the Everton fans was scored 120 miles away at Anfield, from where news was filtering through that Liverpool had conceded to Newcastle in their ultimately doomed bid to win the title. Everton had chances to score more themselves, with Naismith and Lukaku failing to hit the target when presented with a sight of goal. The Belgium striker was involved at the other end when a free-kick from former Everton man Nikica Jelavic hit his arm, but referee Howard Webb waved away Hull's appeals for a penalty. Lukaku, whose future is uncertain with his loan deal from Chelsea now expired, showed what Everton would miss without him when he notched his 16th goal of the season 48 seconds into the second half, shrugging off Paul McShane before finishing calmly. It effectively ended this contest but it did little to dampen Hull's sense of achievement at arguably the club's finest ever season - and it could get even better at Wembley next weekend. Hull boss Steve Bruce: "We've got to the Cup final, everybody's talking about one thing, and it looked like that today. "It's been a huge distraction, but thankfully now it's upon us. "Everton were too good for us. We've sort of limped over the line, which is always disappointing, but overall this season we've done fantastically well." Everton boss Roberto Martinez: "It's been a demanding campaign but the players maintained their standards and made sure we finished strongly. It's been a remarkable season. The Europa League is the step we need to see how far we can go as a football club. "Ross Barkley and John Stones just needed a rest. There is always the opportunity of representing the senior side but if not there is the Under-21s and the Toulon Tournament. "In one way or the other they are going to be busy and that is one of the reasons we had to look after them, to make sure they didn't go into the summer with the risk of an injury." Match ends, Hull City 0, Everton 2. Second Half ends, Hull City 0, Everton 2. Lacina Traoré (Everton) wins a free kick in the defensive half. Substitution, Everton. Lacina Traoré replaces Romelu Lukaku. Foul by Steven Pienaar (Everton). Corner, Hull City. Conceded by Tim Howard. Attempt saved. Robert Koren (Hull City) left footed shot from outside the box is saved in the top centre of the goal. Assisted by Tom Huddlestone. Attempt missed. Curtis Davies (Hull City) header from very close range is close, but misses to the left. Assisted by Tom Huddlestone with a cross following a corner. Corner, Hull City. Conceded by James McCarthy. Attempt blocked. Robert Koren (Hull City) right footed shot from outside the box is blocked. Assisted by Liam Rosenior. Attempt blocked. Jake Livermore (Hull City) right footed shot from the centre of the box is blocked. Corner, Hull City. Conceded by Gareth Barry. Corner, Hull City. Conceded by Steven Naismith. Attempt missed. Alex Bruce (Hull City) header from the right side of the six yard box is too high. Assisted by Tom Huddlestone with a cross following a corner. Attempt blocked. Tom Huddlestone (Hull City) left footed shot from outside the box is blocked. Assisted by Liam Rosenior. Attempt blocked. Romelu Lukaku (Everton) left footed shot from outside the box is blocked. Assisted by Leighton Baines. Substitution, Everton. Steven Pienaar replaces Leon Osman. Substitution, Hull City. Robert Koren replaces Sone Aluko. Attempt saved. Liam Rosenior (Hull City) right footed shot from outside the box is saved in the bottom left corner. Assisted by Stephen Quinn. Offside, Everton. Phil Jagielka tries a through ball, but Gerard Deulofeu is caught offside. Substitution, Everton. Gerard Deulofeu replaces Aiden McGeady. Offside, Hull City. Alex Bruce tries a through ball, but Sone Aluko is caught offside. Attempt blocked. Steven Naismith (Everton) right footed shot from outside the box is blocked. Attempt missed. Seamus Coleman (Everton) right footed shot from outside the box is high and wide to the right. Assisted by James McCarthy. Substitution, Hull City. Liam Rosenior replaces Paul McShane. Corner, Hull City. Conceded by Sylvain Distin. Attempt saved. Aiden McGeady (Everton) left footed shot from outside the box is saved in the bottom left corner. Assisted by Leon Osman. Substitution, Hull City. Matty Fryatt replaces Nikica Jelavic. Goal! Hull City 0, Everton 2. Romelu Lukaku (Everton) right footed shot from the centre of the box to the centre of the goal. Assisted by Leon Osman with a through ball. Second Half begins Hull City 0, Everton 1. First Half ends, Hull City 0, Everton 1. Attempt missed. Aiden McGeady (Everton) right footed shot from outside the box is too high. Assisted by Gareth Barry.